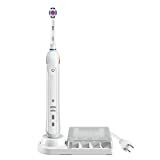 The Pro 3000 rechargeable electric toothbrush falls in the middle of Oral-B’s best selling Pro toothbrush range. Coming from the number #1 dentist-recommended brand worldwide the Pro 3000 provides a clinically superior clean in comparison to your average manual toothbrush (view on Amazon). The Oral-B Pro 3000 promises a fair range of features without the hefty price tag that is so often involved. As well as the basic, everyday clean it offers, it features different modes designed to hone in on certain oral hygiene problems. Oral-B’s leading Pro electric toothbrush range covers over 6 different electric toothbrushes, each boasting a variety of different features. With so many toothbrushes to choose from, it is hard to decide which add-ons are worth the extra cash and which ones you won’t miss. This Oral B Pro 3000 review is here to help put things into perspective and decide if it’s good value for money. How does the Oral-B Pro 3000 work? How does the Oral-B Pro 3000 compare? Who is the Oral-B Pro 3000 suitable for? Firstly, the Oral-B Pro 3000 features a professionally inspired head which includes a specialized polishing cup. This helps to work towards whiter teeth, with results from day one. the dynamic cleaning action rotates, oscillates and pulsates which means it can provide a deeper and more thorough clean. In addition to this, the Pro 3000 boasts three different modes: daily clean, gum care or sensitive, These can be selected to target a specific area of cleaning: and help to tailor your brushing experience (view details). The Pro White brush head is included when purchasing the Pro 3000. This brush head has a unique polishing cup which is specially designed to give results after just one day of use. The professionally inspired shape allows it to surround each tooth individually for the most effective results. Furthermore, the dynamic cleaning action adapts to the shape of your teeth, leading to more plaque being removed. However, while the Pro White brush head is included with the Pro 3000, all of Oral-B’s toothbrush heads are compatible with the brush. The Pro 3000 comes with 3 different modes, which can be detected via the app: daily clean, sensitive and gum care. You can use the modes without having the toothbrush connected to the app, but it is very difficult to decipher which mode you are on without bluetooth. Daily clean mode: this is ideal for everyday comprehensive cleaning and operates a 3D movement for a basic but thorough clean. Sensitive mode: this mode lowers the speed of the oscillations in order to gently clean the teeth and gums. Gum care mode: this mode gently stimulates the gums while brushing by use of a gentle massage feature. The Oral-B Pro 3000 features bluetooth connectivity. This means that you can connect it to an app on your phone for real-time brushing guidance. Not only does it analyse your brushing when your smartphone is with you, but if you forget it, the Pro 3000 stores up to 20 brushes which can then be synced when you next pick up your phone. It also helps to inform you which mode you’re currently using. The pressure sensor included in the Pro 3000 is one of the key features which helps to protect your teeth and ensure a safe but effective clean. If it senses that you are brushing too hard, it will alert you with an LED light, as well as stop the pulsations. Additionally, if you’re using the brush in conjunction with the app, you will have access to more information. In isolation, the Pro 3000 appears to be a fairly effective toothbrush. But how does it compare next to some of Oral-B’s other electric brushes? Like the Pro 3000, both the Pro 500 and the Genius feature a 2 minute timer, as well as a pro timer which buzzes every 30 seconds. But this is where the similarities between the three toothbrushes come to an end. However, if you’re looking for a toothbrush which cleans effectively without any of the added frills, you may be more suited to the Oral B Pro 1000, which, at half the price, features just one daily clean mode and a CrossAction brush head. When it comes to knowing if you can trust a brand, Oral-B is one of the most reputable companies out there. In fact, it is the #1 dentist-used and recommended brand worldwide. As well as this, it is the first electric toothbrush company to be ADA-accepted. However, there has been a previous common complaint regarding the battery life of the Pro 3000, which can be difficult to charge fully. Despite this, issues can often be avoided simply by using the product correctly, such as charging it for a full 22 hours before use. In order to produce the most reliable results and increase the life of the product, correct usage is imperative. Connect the brush to your app for real-time brushing guidance. Apply a pea-sized amount of toothpaste onto the brush head. Spread this over your teeth using the brush head. This will help to get a more even layer of toothpaste across your teeth. Press go! Turn on the toothbrush and gently move around one quadrant* of your mouth. When the timer buzzes move onto the next quadrant. When the final timer buzzes, turn the toothbrush off. Rinse your mouth and continue with your usual oral hygiene routine. Make sure you also rinse the brush head to keep it nice and clean. Don’t forget to disconnect your toothbrush from the phone. Remember not to brush too hard – if you do, the pressure sensor will alert you and pulsations will cease until pressure has returned to a safe level. If, however, problems do arise, Oral-B does not leave you in the dark. Instead, they provide a warranty which covers you for 2 years from the date of purchase. This means that if your Pro 3000 lasted the full 730 days, it would cash in at just $0.16 per day. Additionally, the customer support options available are varied and easy to use. These include live chats, emails and phone calls – whichever method suits you best. Oral-B’s Pro 3000 boasts a fair range of features at a price that won’t burn a hole in your pocket. As one of the leading mid-range brushes on the market, it manages to cover all of the essentials and more. If you’re on the hunt for a toothbrush with premium features at a better-than-premium price, the Pro 3000 may be the brush for you! Do you have to use the bluetooth feature? The bluetooth is an added feature which helps to enhance your brushing experience. Nevertheless, you can use it without actively using this feature. How large is the additional storage unit for the heads? The head storage unit is about 3 x 3.5 inches. Can you tell which mode you’re using without connecting it to the app? Unfortunately, you cannot. However, you can still cycle through the modes manually and use it like this, but the toothbrush itself will not tell you which mode it is on. What is the input voltage? No, it does not come with a travel case. If you are looking for a model which does include a travel case, you should consider the Pro 5000. I was Looking for Oral B Pro 3000 Review. Does it really good and what are its benefits and as Professional Dentist how I can get benefit from it. And For that, I start My Research and During my Research I found this article, and this what I was Looking for In this Article I get My All the Answers and get some extra Knowledge. Thanks for sharing this useful stuff and Keep up the good work. Thank you for your comment, and we’re glad you liked this Oral B Pro 3000 review. Please let us know if you have any questions.